That was the question I got more than 25 years ago from a fertilizer dealer in my county who also had his pilot’s license. I had never flown in a small, local airport rental plane before. To be sure, I was balancing thoughts of manhood preservation against trepidation and outright fear. A bevy of questions ensued. How big is the plane? When was the last engine tune up? Are small, plastic-lined bags provided, or do I need to bring my own? Is there enough room in the cockpit for me along with my camera gear and a Bible? Ultimately, I decided to take that flight and was glad I did. Yes, the plane was small — really small. As the plane gained altitude off the runway, I only hoped that if the worst occurred, we’d go down in an alfalfa field. It seemed senseless and cruel to cash-out with a final resting place among soybeans. Once at cruising height, I soon became fascinated by the view from above and got lots of great 35mm slide photos that I could later use in presentations. The time in the air, about an hour, passed quickly, and we landed without incident, though I had wished questions regarding tire pressure and brake maintenance schedules were previously posed. Fast-forward about 20 years when I got my next offer to fly. This time it came from a recently retired fellow parishioner in my church. He had decided to fill some time in his pension years by getting a pilot’s license. With newly minted license in hand, he was looking for seat 1B passengers. I now knew what to expect from the small, rented aircraft, though pilot experience reservations did creep into my subconscious. Now with digital photography possible, I again couldn’t pass up on the opportunity. As before, the experience was captivating, and my personal pilot flew me wherever I wanted to go to evaluate predetermined farms, fields, and research plots. For the next six years, my church friend and I made our annual “State of the Crops” flight around the county. Each time I drove back to my office from being on one of those flights, I often thought how great it would be if every farmer had the opportunity to “fly” their acreage. From the air, there are things that are easy to see that simply can’t be or are harder to discern on the ground. Nitrogen deficiency, drainage problems, tile line locations, and even planter or seeder malfunctions are easily viewed. It’s also easy to see from the air how what we do or don’t do on the land in terms of soil and nutrient management can impact surface water quality. The connectivity of surface water movement from field to stream and lake is easily identified. 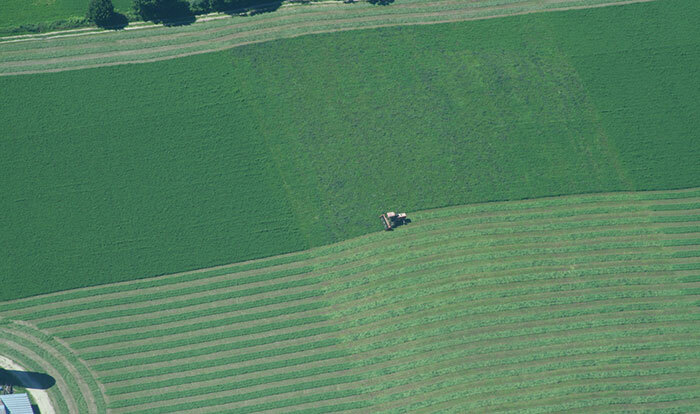 Agriculture from the air is a great advertisement for growing forage crops of any type. My small aircraft flying experiences are the primary reason why the relatively rapid use and acceptance of unmanned aerial vehicles (UAVs), also referred to as drones, in agriculture hasn’t surprised me. In addition to videos and photos that can be obtained, advancements in the evaluative technology and ease of operation have also been impressive. These days, when I visit a farm or ranch for a feature story, I’m not surprised to see a UAV sitting on a bench or in the back seat of a pickup. Farmers and ranchers are using UAVs for a variety of functions that range from checking cattle location and health to monitoring for pests and irrigation functionality. Many crop input suppliers are also offering UAV services to their clients. Viewing and evaluating agriculture from the air will never take the place of boots on the ground. Verification will always be needed; however, the aerial view offers a unique and useful perspective, and it’s one that I still wish every farm or ranch operator could witness at least once per year.